Um…so usually this is the part of the blog where I tell you a lighthearted childhood anecdote, or otherwise let you into some corner of my life. One, because blogs are inherently a bit narcissistic and two, because I think the more you know about me, the better the recipes will taste. I realize that’s entirely made up, but I believe it just the same. But today is a little different because I cannot waste valuable blog real estate (blogestate?) on how when I was five my mom took me on a canoe trip in Minnesota and we got lost and ran aground and had to be rescued after dark and I witnessed the first real panic from an adult in my life, ever. No, that is another story for another time. 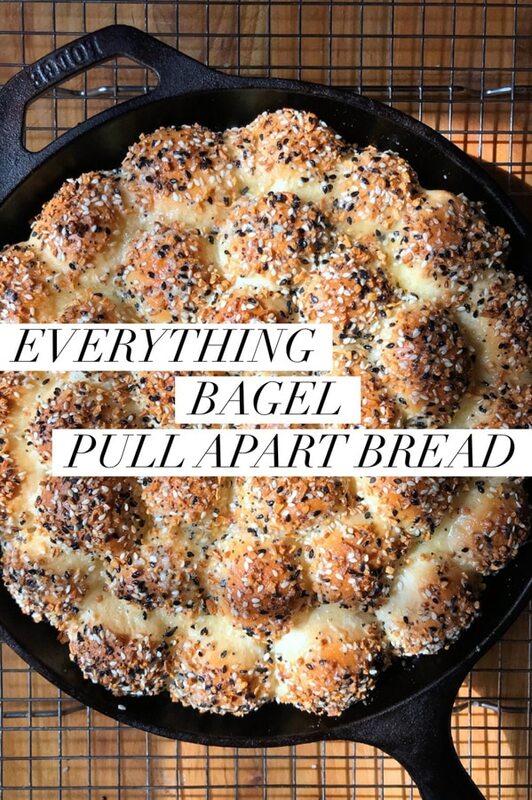 Today is all about this EVERYTHING BAGEL PULL APART BREAD! Get a good look. Basted in garlicky butter, it’s covered in the savory seasonings of an everything bagel. Inside you’ll find a buttery, slightly sweet, incredibly plush interior, and just when you think it can’t get any better you hit the CREAM CHEESE CENTER. And if that description didn’t make you drool (even just a little), then you may need to seek out a blog about cats, or auto repair or something, because maybe food isn’t really your thing. 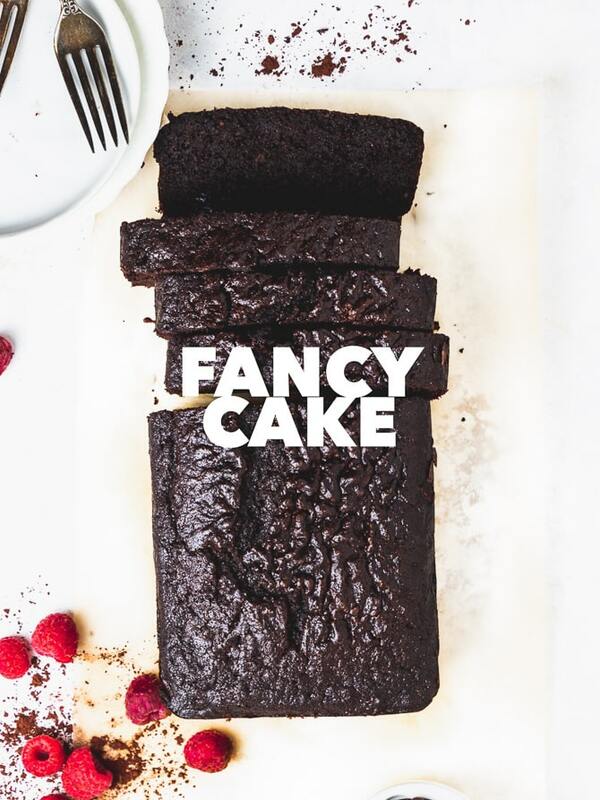 And don’t forget to subscribe (at the top right) to my monthly newsletter for sneak peeks and super, secret, members-only recipes. Thanks so much and enjoy all the carbs! This is a teensy bit consuming (like don’t start it on a Tuesday at 6PM), but it’s great for a Saturday or Sunday because it’s actually pretty fun to make. 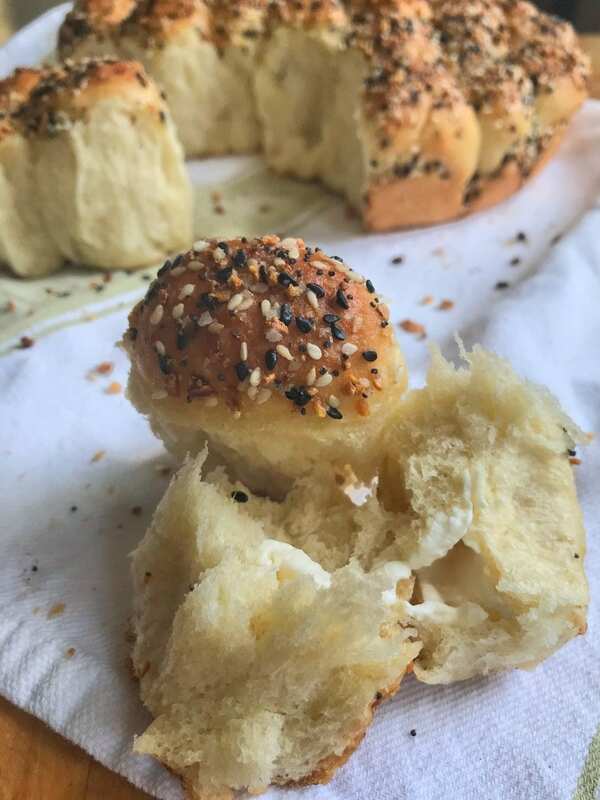 I think kids would really be into the rolling and stuffing bit of the recipe and of course who doesn’t like to sprinkle everything bagel seasoning haphazardly all over puffy bread dough? Measure the flour into the bowl of a stand mixer fitted with a dough hook. Combine the water, honey, oil and yeast and let sit for five minutes or until the yeast starts to foam. Add the yeast mixture to the flour and mix on low speed for five minutes. 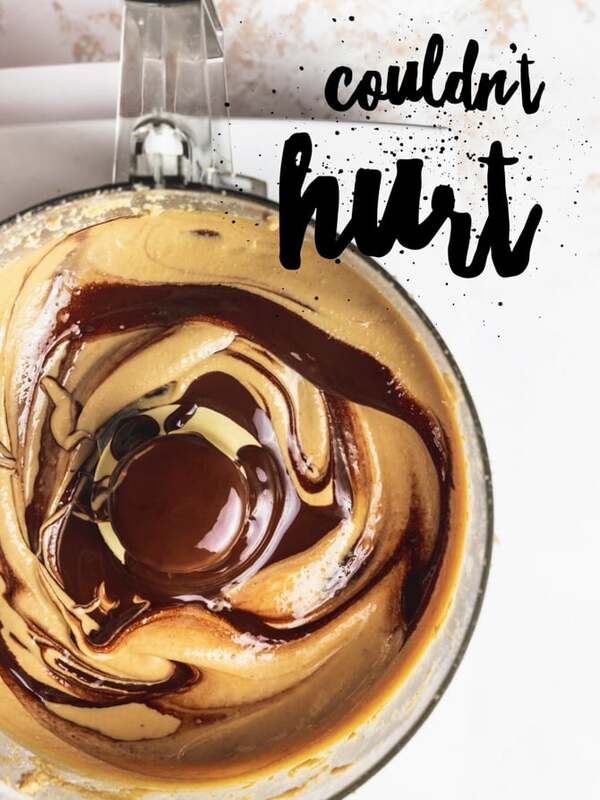 The dough should be just a little sticky. Turn the mixer off and let the dough rest for 10 minutes. Add the salt and mix on medium for six minutes. 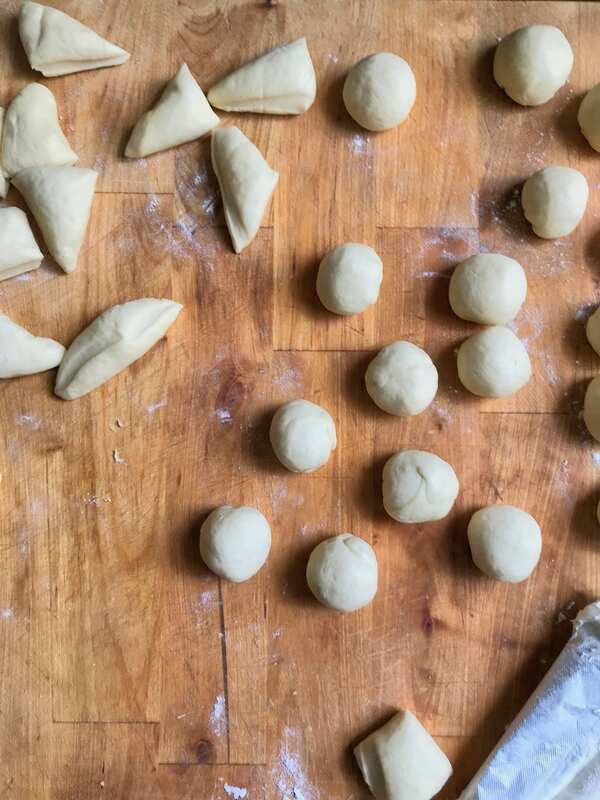 Remove dough from mixer and work into a rough ball with your hands. Transfer to a well-oiled bowl and cover with plastic wrap. Let rise for two hours or until doubled in size. Transfer dough to a lightly floured surface, being gentle and trying not to work it too much. Pat into a rectangle and divide into 36 equal portions. (Somehow my math was wrong and I got 35…not sure how that happened). 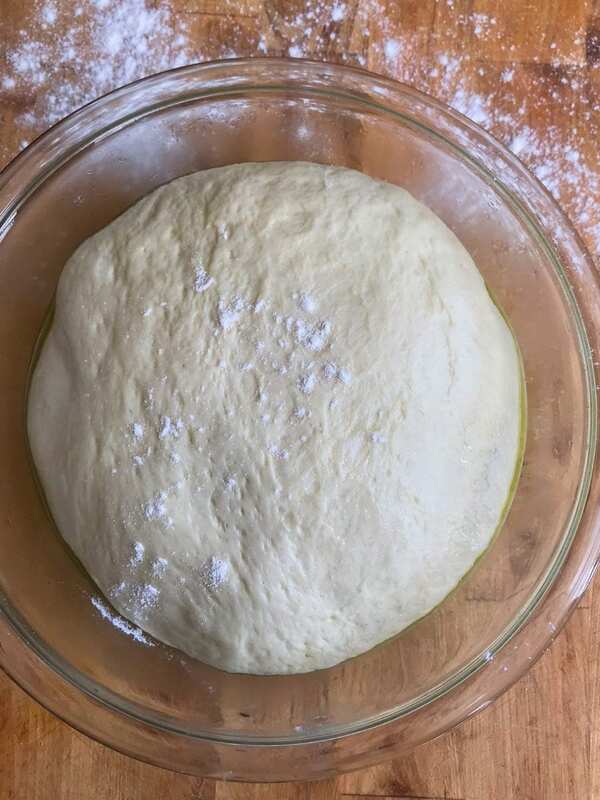 Take a portion of dough and flatten into a disc like…thing. Place about a rough teaspoon of cream cheese in the center. 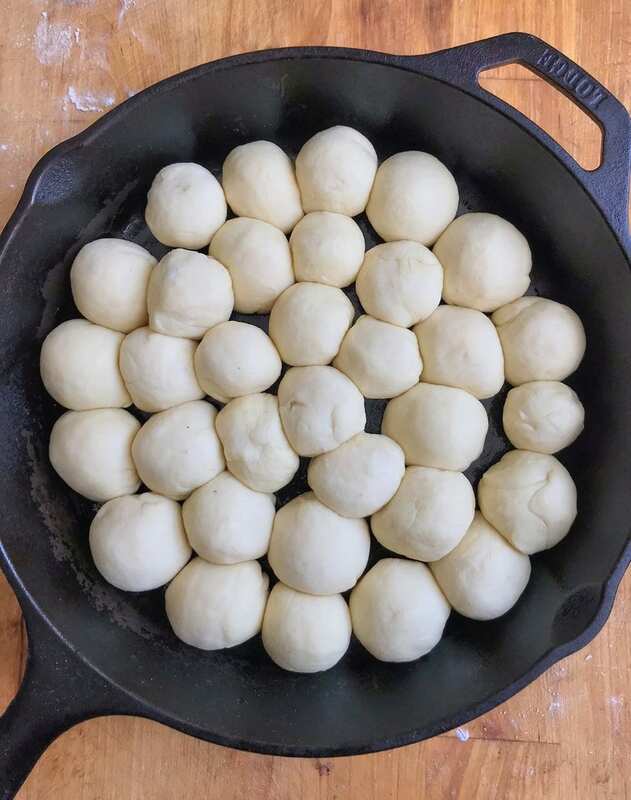 Pinch the dough together to full encase the cream cheese, rolling each one in your hands to shape into balls. 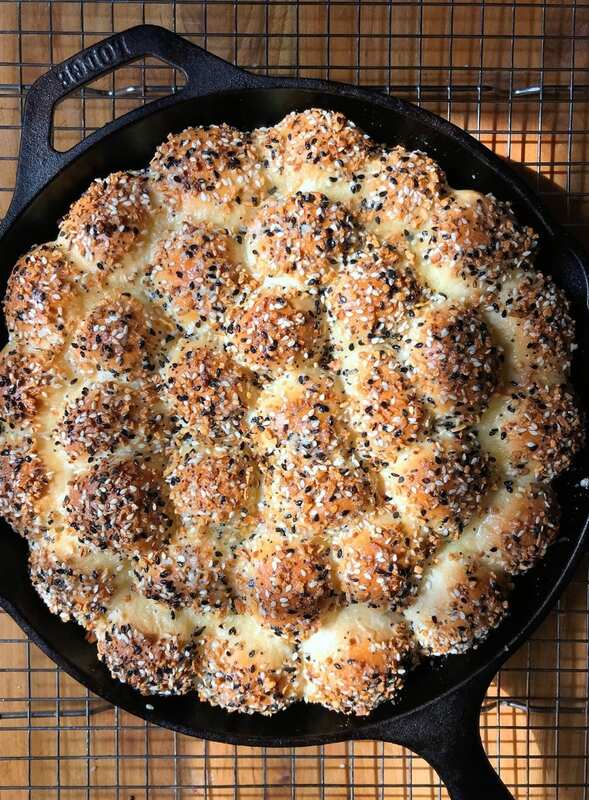 Arrange in a greased cast iron skillet (10 inch) or baking dish (8X8). Cover loosely with plastic wrap and let rise for one hour or until puffed and crowding the pan. Beat the egg with 1 tsp of water and brush the tops of the dough lightly with the egg wash. Then generously sprinkle on the seasoning. Bake for 40 minutes. The tops will be a deep, golden brown and the internal temperature of the bread (in case you were curious) will hit 195° F.
Combine the melted butter, garlic powder, and salt. 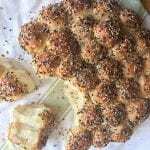 Brush evenly over the top of the baked bread. Let bread stand for 15 minutes, then loosen from the pan with a spatula, and remove to a rack to finish cooling. Leftovers will keep for up to 5 days in the fridge (although we finished ours in about 12 hours). For best results, reheat any chilled leftovers in the microwave for 10-20 seconds. Or if you’re like me just wolf it down in front of the open refrigerator door because 10-20 seconds is way too long to not have this in your mouth. 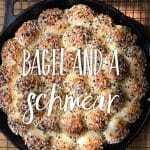 I love Everything Bagels! A while back, I picked up some Everything Bagel seasoning from Costco, and haven’t known what to use it for. So I think I will try it as the seasoning for these (especially since we don’t have a Trader Joe’s)! I’m glad to know they have a version at Costco too! Let me know how they turn out. I also love sprinkling the seasoning on deviled eggs and avocado toast, if you’re into either of those situations.